The brain is miraculous. It is marvelous. Like a huge conglomerate, it runs thousands of businesses that benefit our bodies, sending out hormones, collecting information, and calculating organ activity. However, our brain is also a trickster and a manipulator and sometimes takes us where we would rather not go. In Greek mythology, Phobos was the god of fright. His brother Deimos was the god of fear. The god-nature of Pan was to spread contagious fear through crowds of people. Through stories, the Greeks were comfortable with the concept of different types of fear. Hippocrates’ observances, assessments and writings about fear and phobias were exceptional, considering his contemporaries thought that fear was sent from the heavens. 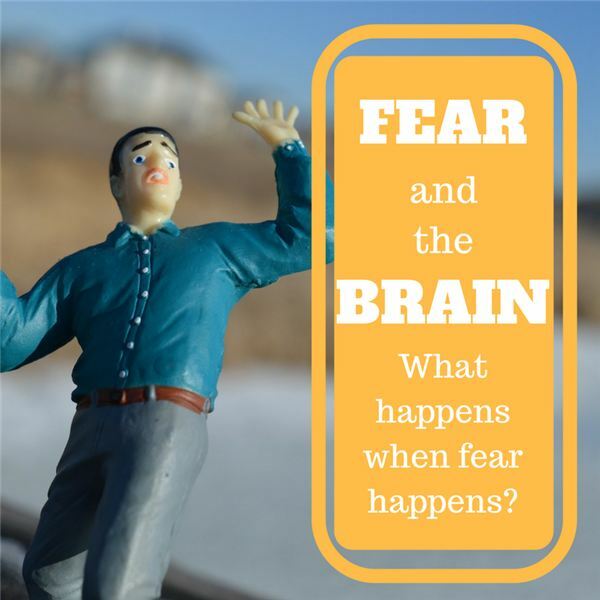 Our brain is primed for fear with the fight-or-flight response. Information from the senses reaches the brain and enters the thalamus, central hub city. The thalamus connects to the advanced conscious parts of the brain in the cortex and the so-called “primitive reptile" regions in the midbrain and brain stem. If your brain interprets by sensory information that something is not good or perhaps something to worry about, the information is relayed to the amygdala for strong emotional processing. The hypothalamus gets the message too. The nervous system kicks in and our bodies are flooded with adrenalin, which equals tension, butterflies in the stomach, rapid breathing and even the relaxing of bowels. This shift to awareness is enhanced and a physical readiness follows. Now, that’s a simplistic version but since induced fear involves many real and demanding physical processes, it takes time to wear off. Toss in an emotional sensation along with the priming trigger to feel angry, which is often projected at anyone who says, “Relax!" The brain can create phobias –distress about something that is harmless. Obsessing about things and having a tendency to worry can cause harm in the form of stress. Many people have anxiety-related disorders because they slide into stress and cannot let go. According to research at Cambridge University conducted on people in an MRI machine and subjected to a fear stimulus (a large spider), the memory-forming portions of the brain reacted simultaneously with the fear response. Your subconscious is not only planning to survive, it is learning from the experience. That is the lasting effect of fear. Researchers say that fear is an innate defense mechanism, a holdover from when humans were in the middle of the food chain. Scientist, psychologist and researcher Lisa Feldman Barrett of one of the world’s largest brain research facilities, Boston’s Interdisciplinary Affective Science Laboratory has a revolutionary take on how our brains actually work. The classical view of the brain and emotions has been that emotions are a reflex response that we struggle to govern in our capacity to reason. Barrett claims we should reject this theory, explaining that our brains contain 85 billion neurons-plus, each wired to 10,000 neurons leading to hundreds of trillions of synapses, all firing at any given moment. “What we see, hear, touch, taste and smell are all simulations of the world, not our reactions to it," says Barrett. The brain operates in a state called interoception, which represents the sensations received from internal organs, tissues, hormones and the immune system. Most people think the things you see and hear influence what you feel, but Barrett says it is mostly the other way around. What you feel alters your sight and hearing. In 2016, Chapman University and the Wilkinson College of Arts, Humanities and Social Sciences, conducted a survey of about 1500 Americans. They asked about their level of fear within 79 different domains such as crime, economics, environment, etc. The top fears were corrupt government officials (60.6 percent), terrorist attacks (41 percent) and lack of money for the future (39.9 percent) quickly followed by being a victim of terrorism at 38.5 percent. Researchers would refer to these as conditioned fears formed from irrational or negative experiences or things you were conditioned to believe because they are the very things you were told were harmful or scary and your brain remembers and acts on that later. Dickinson, Ben. Lisa Feldman Barrett’s “Out of Our Heads: The Secret Life of the Brain”. Elle, February 17, 2017. Mobbs, Dean et al. Neural activity associated with monitoring the oscillating threat value of a tarantula. National Academy of Sciences, Vol. 107, No. 47, Nov. 23, 2010. pp. 20582-20586. Saul, Helen. Phobias: Fighting the Fear. Great Britain: Harper Collins U.K., 2001. Book. Burnett, Dean. Idiot Brain: What Your Head is Really Up To. New York: W.W. Norton & Company, 2016. Book.